See Catalog for complete details. We offer more choices of Operator Lift Control Systems than any other manufacturer! carriage levels, fills pot holes, ruts, etc. Metal LevelFlo1 Leveling Implement, Metal 72" Wide. 1) they can hop wildly on gravel or rock surfaces because of how they're designed (hard steel teeth and steel bars to follow can hop badly). and the underlying soil, which is not desirable (why have rock or gravel top layer and then ruin that layering during grading-grooming). 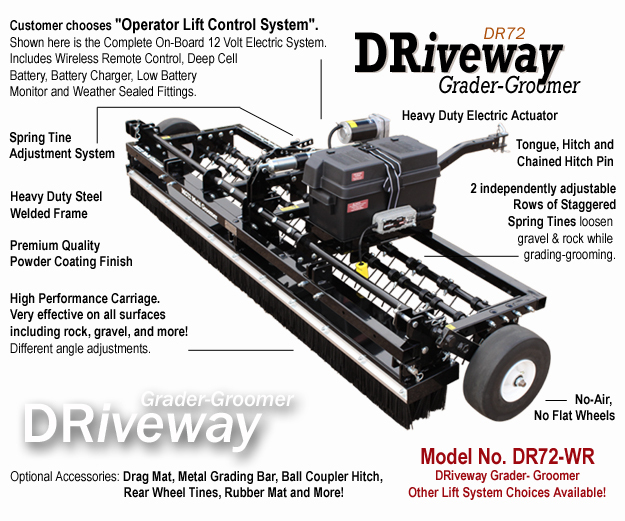 Our DR72 DRiveWay Grader-Groomer design is different, and it works!. degrees of aggressiveness so the user can always decide the optimal setting. effective on rock and gravel, and is much less annoying to use because it's quiet. that can quickly and easily replace the high-performance grader carriage if desired, without tools). Great for Driveways, Yards, Parking Lots, Trails and more! Spring tines loosen while the grader carriage levels, fills pot holes, ruts, etc. Pull with a variety of tow machines. Wide 72" coverage is efficient. Easy to adjust without tools.